We’ve all heard of sugar lace, that sticky, pudding thick, finger paint like cream that gets smeared onto shallow grooved mats and produces the most beautiful, elegant, sophisticated and yet flexible edible cake accessories. The materials and the mats go by many names, the original being Sugarveil, if I’m not mistaken. Some can be purchased in containers and others in packets. In some cases two materials must be combined for the result to be truly effective. Often the product looks rather thick, almost like a plaster, and occasionally it seems to have more of a coagulated milkshake consistency. Some instructions require leaving the prepared mat to be undisturbed overnight while other manufacturers suggest placing the mat in the oven at a low temperature for anything from four minutes to twenty minutes. And last, but certainly not least, most of the brand name products come with their own very special spatulas, which besides being billed as unique and necessary for the task at hand, are also unparalleled in cost. As a side note, I’ve found that the very inexpensive plastic bowl scrapers do the job quite adequately indeed. 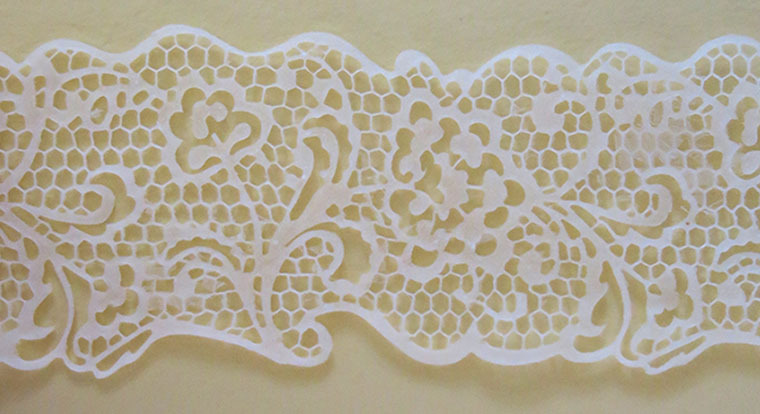 My interest in sugar lace began when I mistakenly purchased two small mats that I thought could be used with fondant or gum paste. That was over a year ago and since then the two pretty mats have continued to lie dormant at the bottom of a plastic container underneath many other silicone molds. Every once in a while I would check out the possibility of purchasing one of the many sugar lace products available on the market, but as soon as one would convince me that it was truly worth the investment, yet another would surface with claims of being the new and better kid on the block. While none of these is cheap to begin with, the shipping from anywhere in the world to Israel is quite prohibitive. And so, like Sleeping Beauty, my lovely mats continued to rest undisturbed…until yesterday! Add the Tylose to the boiling water and mix by hand with a small spoon or a fork until clear. When the mixture is unclouded and nearly transparent, add in the sifted confectioners sugar, cornstarch and meringue powder and mix again. Add the sifted mixture a few tablespoons at a time to make the going easier. Even if this seems as though it will never blend together, it really does after just a few minutes. Then add in the corn syrup and mix again. After this has all been combined to a smooth consistency, add a drop of gel color, if desired. My only “improvement” was to add two additional tablespoons of hot water to the original quarter cup. It’s not necessary for the water to be actually boiling, just boiled or even hot works fine, too. Also I found that after mixing all the ingredients together, if some parts still seemed to be a bit lumpy and not smooth enough, then massaging out the remaining bits with fingertips works wonders. Adding the paste to the mat in layers also helps. I apply what I think is sufficient and bake for 8-10 minutes at 70 degrees C. Then I let cool, apply a second coat and bake for another 5 minutes. After cooling, if the cream seems to be at all below the surface of the mat I repeat and bake for yet another 3 minutes. Then I wait an hour before gently trying to remove the lace. If it sticks at all just let it rest a bit more, for another half hour or so. Of course, now that I have a great homemade recipe, thanks to Veena, I’ve gotten busy searching the web for some larger, better and even more beautiful molds. Hmm…And I thought that having a great homemade recipe was going to save me some money! Hello Mr. Yenner I was so happy to see this recipie. my lace turn out stiff and brittle is there any small change i can make to make it more plyable? I just saw your question now. I don’t know if you’ve contacted Veena and gotten help from her, but in any case it seems to me that your lace either dried out too much while in the stove (In future leave it there for less time and at a lower temperature.) or afterwards if it was left uncovered after it was removed from the mold (Cover it immediately with parchment and place in a nylon bag and then in an air proof box. ) Both the air and the heat of the stove will make it too stiff and brittle. While on the cake it stays nice because of the moisture from the cake. I hope that this has been helpful. I totally agree with your answer. 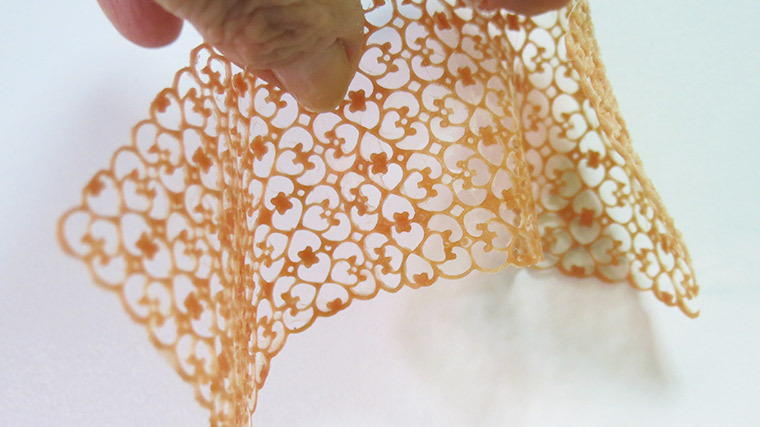 I made some sugar lace more than a year ago and stored them in parchment then in zip top bag and then in a plastic container. I don’t plan on using them anymore because they were made so long ago’iand they are so inexpeensive to make. I am keeping those because they are the ffirst ones I ever made.Read the instructions carefully. Hi Francine. Thank you, thank you! I mean I could give Veena or Dawn credit but I have always followed this group so allow me once again, THANK YOU! 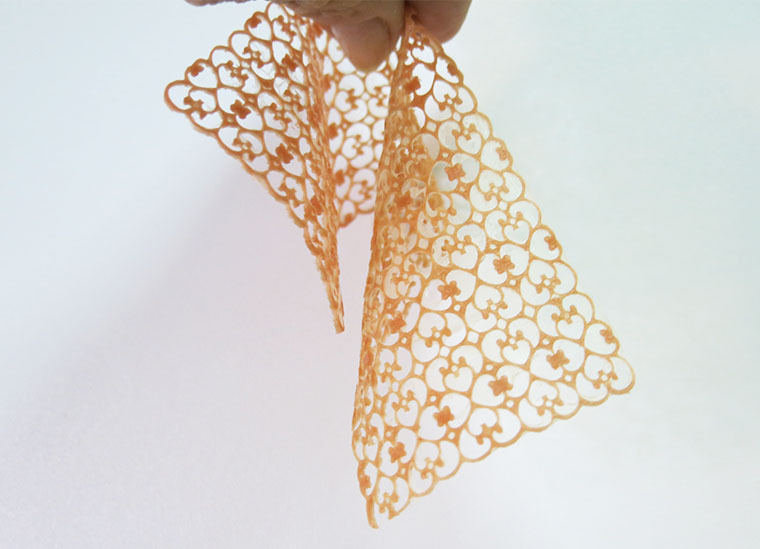 I am wondering before I start this totally awesome recipe and use my mats for the first time, do you know how long the shelf life is on the lace? Also, can I store them in a sealed container or will that ruin the pliability? I’m excited to try this AND, I love the motorcycle. That is so awesome. But I will scale it down for now and order the aquarium type tutorial as I think that will build up the modeling skills. Thanks for sharing your awesomeness. Thanks for your post. I’m giving this a try tonight. Two questions…can this mixture be refrigerated or stored somehow? Additionally, how long will it last?